We don't make many pork chops at our house. I haven't quite mastered the art of cooking pork chops so they are perfectly done so I am a bit hesitant to try it. I decided to be brave and try out this recipe from The Cooking Mom and it turned out delicious. Do you have a preference for pork chops with the fat trimmed off or still on? I've heard that there is more flavor if you cook the chops with a bit of fat still on it, but it is such a hassle to cut up that in the future I will go with all the fat trimmed off. Are there any pork chop experts out there? Please share your tips for cooking a perfect pork chop in the comments. 1. Season both sides of the pork chops with some salt and pepper and the thyme. Heat the oil in a large, heavy skillet over medium heat. Place the pork chops in the skillet and cook for 5-8 minutes on each side or until the internal temperature of the pork reaches 145°F. Remove the pork chops from the pan and keep warm on a plate covered with foil. 2. Add 1 cup chicken stock to skillet you cooked the chops in. Bring to a boil, scraping up any brown bits in the bottom of the pan. 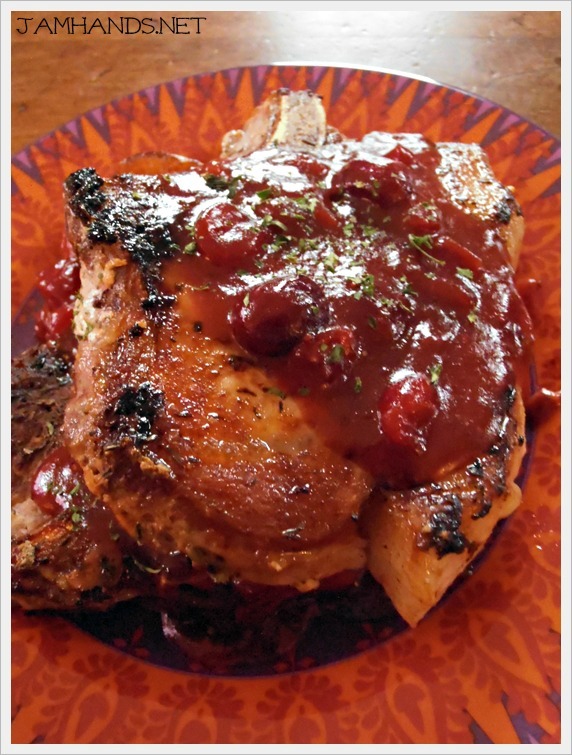 Whisk in cranberry sauce and mustard and cook a few minutes. If sauce gets too thick add more chicken stock. Place any juices from the plate the pork chops were on back into the skillet. Stir in parsley. 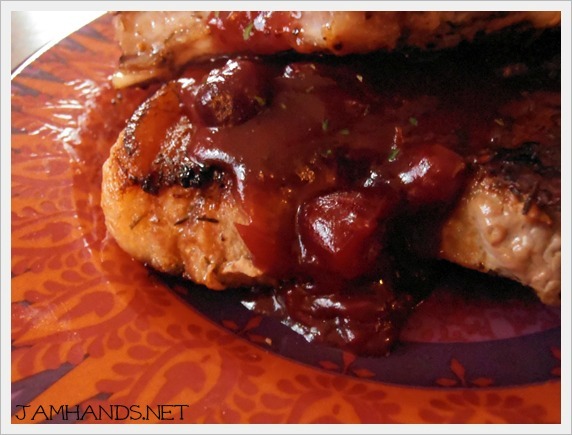 Serve the pork chops with the cranberry sauce on top. Recipe from The Cooking Mom. Looks delicious...nice, hearty winter meal. Thanks for hosting your link-up. Have a wonderful holiday and a happy new year! 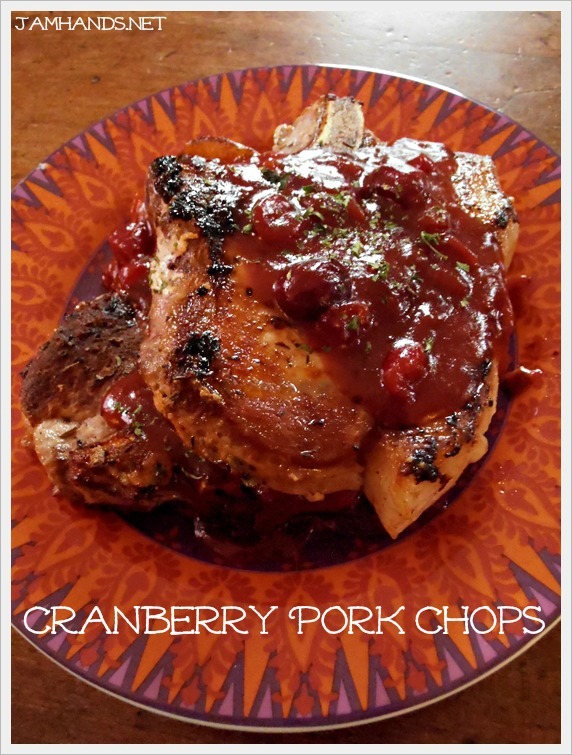 Very yummy pork chops! My husband and I both love it. So glad to hear that. Thank you for the feedback!